In the opening of “Bad Times at the El Royale,” a man (Nick Offerman) enters a hotel room, presumably at the titular El Royale, and spends several hours removing the carpet, opening up the floorboards, and hiding a red leather bag underneath the floor. The room is colorful, with the kind of wallpaper that used to cover the walls of every Vegas casino in the 1950s. He turns on the radio, listening to the comforting sounds of the song “26 Miles,” by Santa Catalina. He hears a knock on the door, opens it to the sight of a man he recognizes; he turns his back, and is shot and killed, his blood hitting the camera lens. The scene perfectly sets the stage for what’s to come, cleverly announcing that “El Royale” will be a tense, slow-burn thriller, with plenty of mystery and suspense punctuated by brutal violence. But the real shock of the film is not any of its many plot twists; it’s that writer-director Drew Goddard goes beyond crafting a good throwback noir, making a film that doubles as an insightful social commentary and a Coen-brothers style, pseudo-religious parable. Jumping ahead 10 years into the late 1960s, the movie’s main plot follows four strangers, whose paths cross at the titular hotel, built on the border between California and Reno. There’s Darlene Sweet (Tony-winner Cynthia Erivo), a soul singer with a job in Reno the next morning; Father Daniel Flynn (Jeff Bridges), a Catholic priest suffering from dementia; vacuum salesman Laramie Seymour Sullivan (Jon Hamm); and cynical hippy Emily Summerspring (Dakota Johnson). Being a thriller, no one is as they seem. But to say more would be to spoil one of the main delights of the film; namely, its numerous layered and unexpected plot twists. Even the most attentive viewers won’t see every reveal coming, including a genuinely shocking early death of an important character. Moreover, unlike most thrillers, Goddard refuses to spell everything out for his audience. Major plot twists and revelations are made clear to the viewer, obviously, but there are some secrets that are left unspoken. The dots are all present; now we must connect them. There’s also the Tarantino-esque plot structure, in which the film frequently utilizes flashbacks to deliver important exposition and character development and jumps between perspectives of the same events. The result of all this is a thoroughly engaging narrative that demands your utmost attention. It also certainly helps that the story is brought to life by a fantastic cast. Erivo is the clear stand-out, portraying the moral heart of the film with raw emotion and charisma. Her fantastic singing voice is put on display nearly every available opportunity, and it’s hard not to be grateful for the chance to listen to her belt out classic songs from yesteryear. Bridges is unsurprisingly excellent, bringing a genteel charm with tragic undertones to Flynn, a man for whom life has brought terrible suffering. Hamm is right at home here, riffing on his old performance in “Mad Men,” albeit with some differences brought about by an early plot twist. Johnson is perhaps the weakest link in the cast, but this really only seems to be because her character is underwritten; otherwise, her steely demeanor and grit make lend some depth to someone who otherwise doesn’t get enough screen time to really shine. 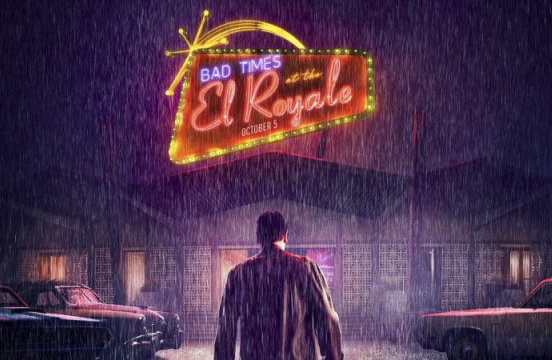 From a visual standpoint, “El Royale” is an absolute treat. Goddard, with the help of his cinematographer Seamus McGarvey, treat us to a terrific mix of an idealized view of 1960s America, contrasted with dark and violent imagery. The pair consistently contrasts the colorful appearance of the hotel with its many dark secrets. Goddard is particularly good at building suspense, to the point where seemingly innocent dialogue between two people seems like it could turn violent at any moment. He knows what to show us and what to keep hidden from us; how to cut between multiple points of view as things are about to go from peaceful to bloody. Even more so than his previous film “A Cabin in the Woods,” “El Royale” knows how to keep an audience on the edge of their seats. Perhaps he’s too good at that: it was only at the end of the film that I realized the film was also doubling as a social commentary, and a pseudo-religious story about purgatory and redemption. I had been too thoroughly engaged with the twisty narrative to notice that all the references to the Vietnam War were not set-dressing, but part of a prolonged examination of how during the war, America had no sense of right and wrong, caring only about the struggle to violently dominate others. It’s an idea perfectly embodied by a cult leader who appears in the film’s third act, Billy Lee (Chris Hemsworth, who combines his usual charisma with a sinister edge, making him the perfect actor for the role). I won’t say too much about his role in the film, but his ideology is clearly meant as a jab against the United States’ actions in the war, ignoring questions of morality in favor of violence and indoctrination. He’s also (one of several) men throughout the film who manipulate women for his own ends, making up the second aspect of the film’s commentary: the world is a place run by men, who often care little about women beyond using them for their own manipulation. It’s hardly an irrelevant message for today (even though it could have been developed further). Then there’s the side of the film clearly inspired by the Coen brothers, in which religious symbols and ideas are used in a decidedly secular world. Many of the Coen brothers movies operate under a system of morality, in which sin is (sometimes) punished by men, not gods. The same philosophy applies to “El Royale;” the hotel is a kind of purgatory, in which each of the characters must grapple with their past sins. But, despite the presence of a priest, it is not God before whom they must repent, but each other. There is no real order to the world they inhabit, and there is no God to save the good and punish the bad. Who gets to be saved and who is punished depends on sheer luck and a little ingenuity. Still, the film suggests there are still reasons to be good, even if doing so won’t necessarily lead to good consequences. While there is much to praise about the film, certain problems hold it back from being as great as it could have been. Its characters, for starters, never feel fully developed. Each is given a flashback or two to explain their backstory and motivation, which is a smart way to get around exposition dumps. But it also means we never truly get to know the characters beyond the bare minimum we need to know about them. Scenes that are meant to be moving and emotional have less impact as a result. Then there’s the uninspired climax, which ties up all loose ends with in the least creative way possible. Finally, while it’s not really a major issue, the film never does anything with the fact that the hotel is in both California and Nevada; it’s certainly neat set-dressing, but it’s hard not to wish for greater payoff. These are all nit-picks, though. The film is otherwise fantastic, a visually stunning film with an absorbing and genuinely surprising plot. It may hold itself short of being an instant classic, or on par with its sources of inspiration (it can’t compare to a Coen brothers or Tarantino classic), but it makes one thing clear: Drew Goddard is a filmmaker to watch out for.